Firing your pool guy (or gal)? Before jumping to conclusions and blaming the pool guy for the problems in the water, collect facts. It's one thing to fire a pool guy for bad behavior or customer service...but firing them for things that may be beyond their control deserves due diligence beforehand. This article is our guide to know when (or when not) to fire your pool guy. But first, some context. I answer the phone here at Orenda, and I get calls on various topics. I do my best to guide customers toward best practices or advice to handle their issues or various needs. While many of the calls I receive are similar, inevitably there will be some calls that perplex us. It boils down to this: without the facts, we don't know much at all. 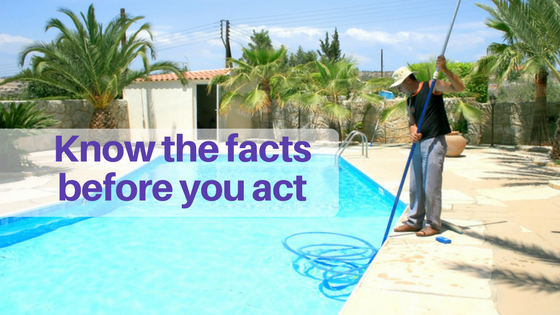 Item number one in our guide to firing your pool guy: know the facts. One phone call stands out in particular, and I will use it as a case study for this article. The customer on the phone kept referring to his pool guy in the past tense...because he had already been fired, and all the problems were his fault. You see, this customer told me his chemicals were out of balance and he was angry at the way his pool was being cared for by his former pool guy. So what did the homeowner do? He found a local pool store (probably by asking Siri for "pool stores near me"), and had his water tested. The clerk at the pool store told him his pH was too high, alkalinity too low, and his cyanuric acid levels were too low also...at least, according to the pool store clerk. Personally, hearing those numbers I became less concerned, because the numbers could be a LOT worse. But this customer made it sound like his pool was full of toxic sludge. So I asked him "what type of sanitizer are you using in your pool?" He replied "I have a saltwater pool system." Let's break this down and apply this story to our guide to know when (or when not) to fire your pool guy. This customer fired his pool guy for having chemistry out of balance, but did not have all the facts first. This was a salt pool. Look, I have cleaned and maintained pools for many years. I know the struggle it is to keep the pH low and the alkalinity balanced in a salt pool. You can pour in all the pool chemicals you want, but it's difficult chemistry to manage. You see, a salt cell produces chlorine at the cell through electrolysis, and the chemical byproduct (sodium hydroxide) has a pH of about 13. Since it is a hydroxide, it also increases your total alkalinity. Sodium hydroxide will constantly be raising both pH and alkalinity in a swimming pool. The constantly rising pH requires excess acid or CO2...but most residential pools don't use CO2. Using acid not only lowers pH, it lowers alkalinity too. That explains why his pH is constantly "creeping up" and his alkalinity was low. It is a vicious cycle that needs to be managed carefully with salt pools. In my opinion, having only 30 ppm of cyanuric acid (CYA) was great. The lower the better. Normally when I talk to people, their CYA levels are 100+, then they lose the ability to test to see how high it really is. This customer trusted the word of the pool store clerk that the CYA was too low, and bought CYA to rectify the "problem." This customer could have validated that advice with a few taps on his smart phone at the store. 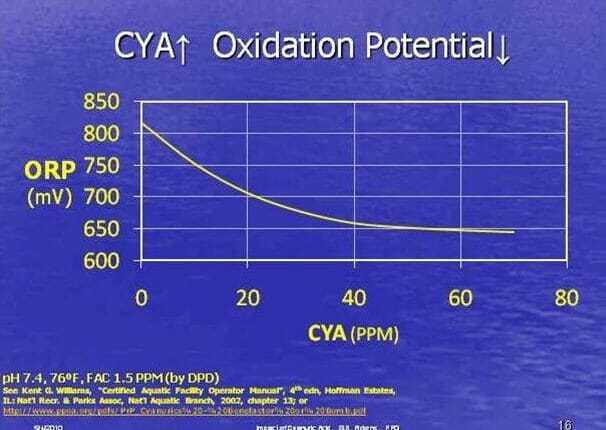 Most reputable sources will tell you that CYA significantly weakens chlorine. The more you have, the lower the ORP. The chlorine lock out factor is estimated to be about 7.5%. Remember, they work for you! You are their customer and have the right to ask questions. Ask the pool guy what type of chlorine (or other sanitizer) is in your pool. Ask them what their targeted water chemistry is: pH, alkalinity, chlorine level, CYA, calcium hardness, etc. Pool service men and women make a living cleaning and maintaining pools every day. I know because I did it for many years. It's hard work, and it takes a tremendous amount of aptitude to be good at it. Give your pool guy some credit...maintaining pool chemistry on a weekly basis is challenging in itself. It would be much easier if it were maintained daily. But obviously that is not financially feasible for most customers. Had the customer who called me simply asked questions of his pool guy, he would have learned that salt systems raise the pH, and the acid he uses to keep the pH in acceptable ranges knocks down alkalinity. He could have explained why, and the homeowner may have not overreacted. Even if you're informed and knowledgable about your pool, it takes time and effort to maintain. It is more commitment than it sounds like. You may think you can do it all with a pool chemical calculator and the right pool chemicals (or hot tub chemicals). From a pool chemistry standpoint, you could be right. But what happens if/when you your pool turns green? Simply googling "algae in pool" can give you advice..but ultimately, you're going to need to do the work and diagnose the problem. What if it's not algae in your pool, but copper? What if you treat your pool for algae with a shock that just makes the problem worse? The pool guy should know how to diagnose problems and solve them. Remember, they do it every day. Give them the benefit of the doubt until they prove otherwise. I told the customer on the phone that he did not need to fire his pool guy. He just needed to understand what his pool guy was managing on a weekly basis. Moreover, understand that if you stop into a new pool store or call a new pool guy for advice, you are teeing up the conversation up for bashing the “other guy”. Be careful what you hear and do some research, find a trusted source, and validate what you are being told.